The best way to see Cape May is to walk through town. But before you can hit the streets, you need to get out of your car. This page contains information on parking, the Park & Ride Trolley service, and local bike rental and taxi services. During the summer, finding parking places in Cape May can be a challenge. There's heavy traffic in the center of town and limited spaces available. The majority of parking spaces in this area are metered. The good news is that no matter where you park in Cape May, you're probably not more than a 20-minute walk to the center of town. When are the meters on? Meters near the Washington Street Mall on Carpenters Lane (from Perry Street to Ocean Street), Lyle Lane (from Decatur Street to Perry Street), and Mansion Street (south side) are in effect every day from April 1 through December 31, between 10am and 10pm. Parking in this area is restricted to three hours. 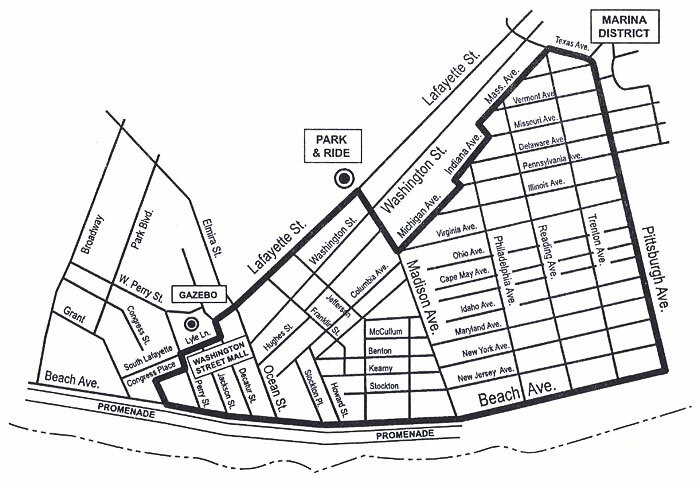 For all other streets (including the beachfront), parking meters are in effect every day from May 1 through October 31, from 10am to 10pm. Parking meters cost $0.25 for 15 minutes. Standalone meters accept quarters and work with the Parkmobile app. Multi-meters accept dollar bills, credit cards, and work with the Parkmobile app. The City provides a five (5) minute grace period on all meters before an overtime violation occurs. Cape May's parking meters work with the Parkmobile App, which allows you to pay by smartphone and keep an eye on your meter from the beach. The Parkmobile app is available in the App Store, on Google Play, and in the Windows Store. During the summer months, free parking is offered in the Cape May Elementary School lot on Lafayette Street. The Park & Ride service runs from the lot to locations in town on a regular basis. Overnight parking is not available. When school is in session, free parking is available Saturday and Sunday only. Good news: There are free parking spaces on many side streets throughout town. These typically fill up early in the morning, but if you don't mind driving around, you can find occasional spaces open during the day. Great news: All parking is free in West Cape May. If you don't mind a short walk, you can park on any of the shady side streets and save some money. In the evenings, several businesses offer parking spaces for a flat fee (usually between $7 and $10). While this isn't necessarily more economical, it can be less of a headache. Parking is available at Washington Commons (where Acme grocery store is located) for an hourly rate. The first 30 minutes is free, so this is a great option if you are making a quick trip to the grocery store. The Washington Commons lot closes at 11pm and is not intended for overnight parking. During the winter months, this parking lot does not charge. Parking in the Bank Street Lot is by permit only in-season (dates are posted on the sign). By law, handicapped persons properly displaying a special license plate or placard or parking permit issued by the State of New Jersey under NJ.S.A. 39:4­ 205 or any other state, district or territory of the United States, or by Canada in accordance with N.1.S.A. 39:4-207.5, you are not required to pay parking meter fees. Exemption from parking meter fees only applies to a vehicle properly displaying a placard and/or wheelchair license plate when the handicapped person to whom the same is issued is the driver or passenger. Any vehicle properly displaying a placard and/or wheelchair license plate may only remain parked in one location for up to 24 hours. Any vehicle remaining in one location in excess of 24 hours is subject to penalties. Due to the historic nature of the town, not all Cape May accommodations are able to offer on-site parking (cars weren't around when some of them were built). Always ask your accommodation about parking. Many have parking permits for lots around Cape May or they may offer valet parking. In some cases, you're on your own and must find parking for the duration of your stay. In this case, we recommend finding a free spot early in the morning, parking your car, and only moving it if absolutely necessary. Parking in West Cape May is a great option if you don't mind a short walk! In-season, the Great American Trolley Company offers Park & Ride service to the Washington Street Mall, beach, and promenade, and one-way trolley rides in Cape May. 12:00 noon to 11:00 p.m. daily in a continuous loop during the summer season (July through September). $1.00 per person, per way. Parking is free at the elementary school on Lafayette Street. Where does the trolley stop? The driver stops at any corner on the route. Just flag the trolley. To check where the driver is on their route, please call 609-846-4057. The Park & Ride lot is located at 921 Lafayette Street inCape May. Do you have a question about parking? There are several taxi companies in Cape May, but you will need to call to arrange for pickup. We would recommend asking your accommodation for a taxi company that serves their location. Where can I park my RV/camper in Cape May? If you plan to be in Cape May for the weekend with your camper or RV, we recommend reserving a space at a local campground.